Shrubs can be a low maintenance addition to the landscape. They can serve as privacy screens or soften the lines of the garden. Planted alone or in groups, shrubs come in a variety of shapes and sizes to complement or frame any type or area of the home. When planting shade area shrubs, consider the reason for the shade. Nearby trees that cause shade could compete for moisture and nutrients needed by the shrub. The Oregon grape holly (Mahonia aquifolium) is a shade-loving shrub that grows to a height of 3 feet. Plant in an area protected from wind and winter sun. A broadleaf evergreen, the Oregon grape holly makes a good landscaping shrub because of its interesting fruit and flowers. The new growth of the Oregon grape holly also draws visual interest because of its bronze color. The summer flowering bottlebrush buckeye (Aesculus parviflora) grows best in the shade, but it needs a lot of room to grow. The multiple stems of the bottlebrush buckeye can spread over 15 feet wide and reach heights up to 12 feet. The huge white flowers are about 4 inches wide, but can be up to a foot long, sure to grab the attention of anyone in the area. The bottlebrush buckey is native to Georgia and Alabama. Get the advice of a local garden center to see if it will grow in your area. Two shade-loving hydrangea shrubs will bring beauty to any landscape. Growing to almost 5 feet high, the bigleaf hydrangea (Hydrangea macrophylla) is especially appealing for its huge white flowers in the shape of a globe. The oakleaf hydrangea (Hydrangea quercifolia) is another hydrangea that does well in the shade. The oakleaf has cinnamon color bark and turns to a burgundy color in the fall. A shrub that is attractive year round is the witch alder (Fothergilla gardenia). 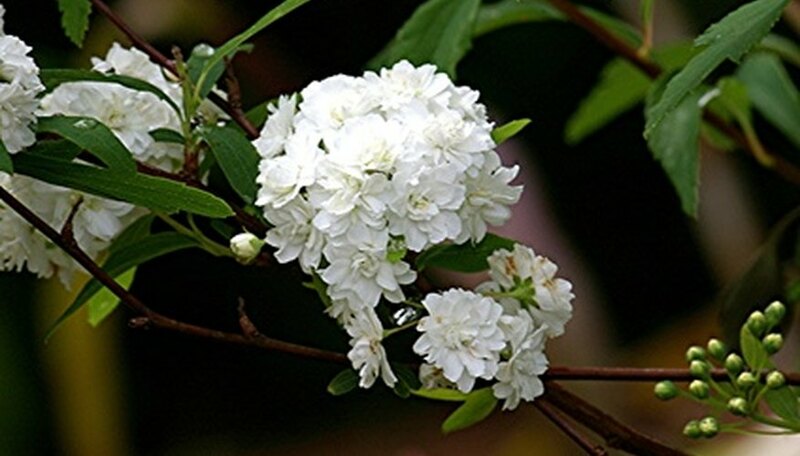 Flowers appear before the first leaves in this slow growing shrub that grows in as well in the shade as it does the sun. The cream-colored, fragrant flowers give way to brilliant foliage colors in crimson, orange and yellow. The mounded shaped shrub grows only to a height of 2 to 3 feet. Summersweet clethra (Clethra alnifolia) is a good choice for a narrow shady spot. It grows to between 3 and 8 feet tall and blooms in midsummer. The fragrant flowers range from white to pink or deep rose in color. Summersweet clethra likes a slightly acidic and moist soil and is seldom bothered by insects or disease.